Make a pair of bling bracelets in 30 minutes or less. An easy DIY craft tutorial idea for DIY Jewelry you can show off your own fashion and style. Do you like to make handmade jewelry? A girl can’t have too much jewelry and there is nothing like receiving a compliment on something you made! Recently, I was given some Bling on a Roll for a sponsored post. I created a tutorial on how to Bling your Jeans. I turned some boring clearance jeans into fun stylish jeans for my daughter. They quickly became her favorite. In fact, it is hard to get them off of her to wash them! Bling on a Roll is such a fun product that I had to create another awesome project! This time, it’s for me! Layer by ribbon – single strand of Bling on a Roll – ribbon. Clamp together at the end. Braid the 3 strands making sure the sparkly side of the Bling on a Roll is always facing up. When it is desired length trim the end and secure with another clamp. Attach the lobster claw to one clamp with a jump ring and attach a jump ring to the other clamp and your bracelet is done! Layer a double strand of Bling on a Roll onto a strand of ribbon. Secure both ends with a clasp. Attach a jump ring and clasp to one clamp and a jump ring to the other clasp. And that is all there is to it! You now have a pair of cute bling bracelets! What handmade jewelry have you made? Share and leave a comment below! 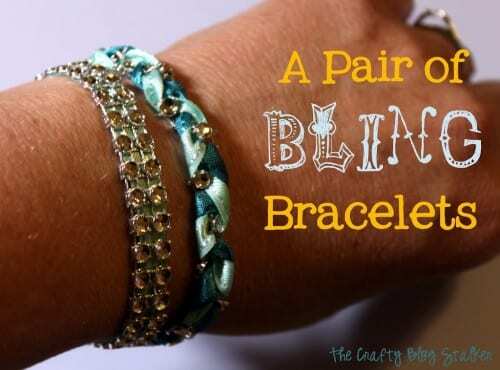 SAVE HOW TO MAKE A PAIR OF BLING BRACELETS TO YOUR FAVORITE DIY JEWELRY PINTEREST BOARD! These bracelets are so cute!! I’ve been on a jewelry making kick lately and this inspires me. Really cute. Wondering where you buy the Bling On a Roll? Is it available at Michaels? These are very cute. I’m pinning for when my daughter is a bit older. These are really pretty and look so easy to make! Thanks for sharing! Thank you for sharing at Freedom Fridays!